The Paleo Indians appeared in North America at the end of the last Ice Age, making them the earliest inhabitants of the Americas. It is believed that they came from Asia, using the Bering Land Bridge. The Bering Land Bridge appeared about 12,000 years ago during the Last Ice Age. At this time, tremendous amounts of ocean-water became glaciers. Consequently, the sea level dropped, which exposed land between modern Siberia and Alaska. This land bridge allowed people and animals to migrate from Asia to the Americas, including the Paleo Indians. The Paleo Indians are sometimes referred to as the Clovis People. This is due to a particular archaeological find. In 1929, local residents discovered fluted stone arrowheads at Blackwell Draw, which is a prehistoric site near the town of Clovis, New Mexico. The arrowheads were dated back to around 10,000 years ago. Consequently, the discovery shocked the archaeological community, pushing the estimated time of inhabitation in North America farther back than previously imagined. The Paleo culture lasted until about 10,000 years ago, which means the Paleo Indians lived during the Paleolithic age, also known as the stone age. The stone age is the time period that makes up most of our history. It began with the creation of the first stone tools about 2.6 million years ago, and ended about 10,000 years ago. Therefor it makes sense that the word "paleo" comes from the Greek word "Palacios" meaning ancient, very old, or long ago. Paleo Indians were primarily nomadic hunters. 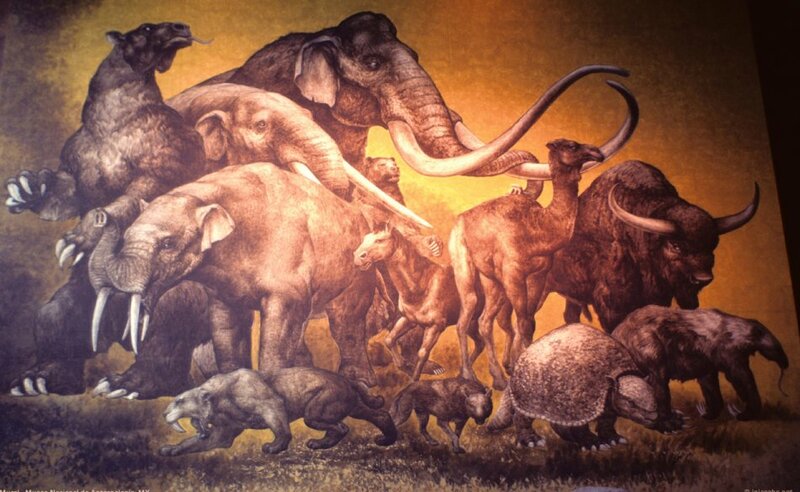 They hunted megafauna, which are large animals who are mostly extinct today. Examples of the mega fauna that the Paleo Indians hunted are giant sloths, mammoth, camels, saber-toothed cats, mastodons, and glyptodonts (giant armadillo). These mega fauna were migratory animals that traveled in herds, so the Paleo Indians had to follow the herds of the animals that they relied on for food. This resulted in a nomadic lifestyle, since they would have to move every couple of weeks to keep up with the mega fauna. Of course Paleo culture is famous for the use of an amazing invention called the atlatl. The atlatl is a 24 inch long wooden handle. At one end there is a handgrip, and at the other there is a "spur". The "spur" is a point that fits into a hole on the back end of the dart. The darts that are used with an atlatl are usually four to five feet and quite flexible. The dart is held parallel to the handle, before being launched in a sweeping arm and wrist movement. The result is a much stronger and accurate throw, and ultimately something that could not be done by hand. A well tuned atlatl is capable of throwing a dart up to 450 feet, with an accuracy of 90 feet. Up close, the atlatl is a deadly hunting device that has impeccable accuracy and astonishing speed. Due to the atlatl, Palo hunters were able to strike down their prey from far away, rather than having to come close and put themselves in possible danger. Overall, the atlatl was an extremely influential invention in Paleolithic times. In the YouTube video below, Robert Berg talks about the atlatl and shows us how to use it. Marianne Eaton, who is the host, provides commentary of her experience using an atlatl. One of the techniques the Paleo Indians used to kill these large animals for food was quite complicated and required extensive planning. The idea was to drive herds of these large animals into natural traps, where they would be easier to kill for food. One of these natural traps was a cliff face. Paleo Indians worked together to steer these herds of animals off the edge of a cliff. Hunters at the bottom of the cliff would then finish off any animals that survived the fall. Steering the wild herd of animals towards the desired destination required strategic placing of hunters. In the YouTube video below, the "weapon masters" examine the atlatl compared to the bow and arrow. They also determine the mathematical formulas behind the atlatl and learn how to create their own atlatl.